I will admit right at the outset that, as yet, there is no film connection with this book. Yet thinking about the TV serialisation of The 10th Kingdom earlier this year and the fact that Tolkien's The Lord of the Rings is presently in production in New Zealand, one wonders if the lesser yet extremely popular fantasies of Terry Pratchett, Stephen Donaldson (The Chronicles of Thomas Covenant etc.) and the Eddings may also be destined for the big or small screens. After all Harry Potter is all set to be filmed. 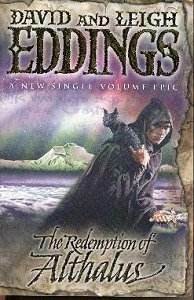 David Eddings work has been heading the popular best selling lists for some twenty years now and his multitudinous fans have avidly devoured his five-book Belgariad, and Malloreon epics, his three-book Elenium and Tamuli sagas and his latest trilogy co-authored by his wife Leigh: Belgareth the Sorcerer, Polgara the Sorceress and The Rivan Codex. The Redemption of Althalus, their new collaboration is a one volume epic thus making it more viable and manageable as a screen play. The story contains many elements familiar to readers of earlier Eddings epics: a Herculean struggle between the powers of light and darkness involving gods and goddesses and sorcery, and the recruitment and adventures of a team of six apostates, including two women - one a tiny Princess (another Eddings stock character) and an alleged witch, a remarkably insightful child and a priest whose faith and values are tested to the limit. They are led by Althalus who at the beginning of the book is a thief and occasional murderer. He is persuaded by the chief villain, Ghend in the service of Daeva, the God of darkness, to steal a book from the House at the End of the World. When he gets there Althalus meets a talking cat who turns out to be the Goddess Dweia who persuades him to turn to the cause of Light, educates him in the ways of the book and sends him out to lead his followers to combat Ghen and his followers. Before their final victory, they are involved in huge battles and sieges, holy insurrections and complicated duplicities involving intricate magical doors that enable the heroes to travel through time and space. [These doors would certainly offer the special effects people some interesting challenges]. This is a rattling good read; a jolly adventure spiced with lots of thrills, comedy and romance. Suspend all belief; relax and enjoy the roller-coaster ride.